I’m still here and having more fun than ever. Recently I’ve been able to mess around with some small batch brews again! Mostly it’s for research and to prop up some new microbes for larger batch use, but hey we do get some beer out if it! 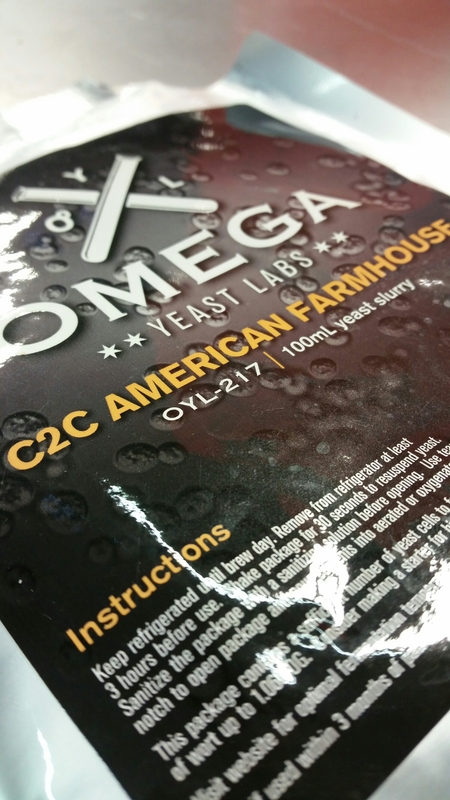 2 new ones I kicked off last week are from Omega Yeast Labs: American Farmhouse and HotHead. The Coast to Coast American Farmhouse is a blend of a Saison strain from the Northeast and a Brettanomyces from the Northwest. It’s pretty obvious to me the sources, especially when I smell the Saison fermentation. The test batch I did with this blend used Pils, Wheat and a little bit of acid malt. Hopped to 18 ibus with a German Noble hops. I pitched at 65F and it self rose to 71F in 2 days while foaming out of the airlocks. The ambient temp is 66F so fermenting in day 5 has slowed down, but continues to bubble the airlock 1 or 2 times a second. OG was 1.053 and it currently sits at 1.022. This beer is very very young but the aromas of citrus, bubblegum and clove remind me of my beloved strain from Blaugies. It’s still too young to detect and Brettanomyces, but I’ve been told this particular one shows up fairly young. The other strain I’m testing is called HotHead using the same wort as above. I don’t have a picture of the packet because it wasn’t available when Omega sent it to me. It is now available for homebrewers. The story on this Norwegian sourced strain is it ferments at almost any temperature with a fruity character. They list a range from 62 to 98f, however I decided to push the low end and pitch at 48F. It self rose over the course of 2.5 days to 69F. When I check on it Monday I could see krausen marks into the carboy neck, so it did kick off even at the low pitch temp. 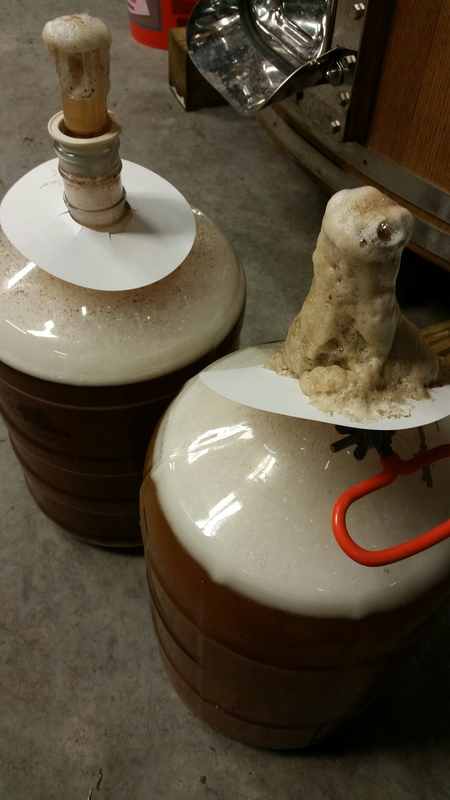 Krausen has mostly fallen on day 5, but still shows co2 off gassing in the airlock. 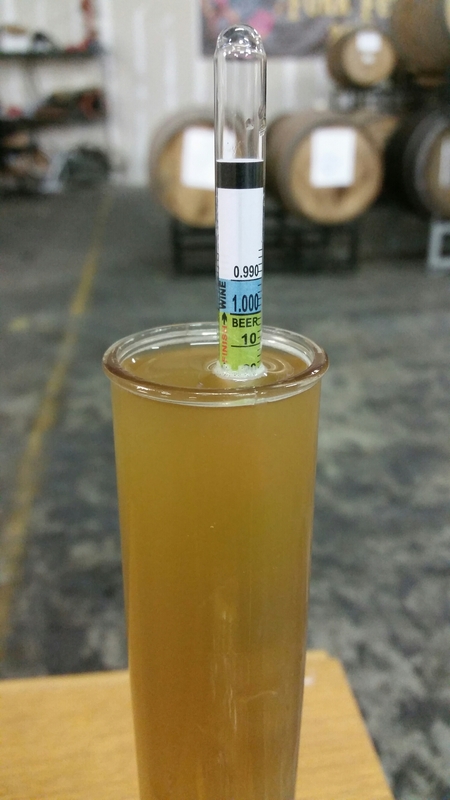 Current gravity is 1.020 and tasting fairly clean with no off character such as sulfur. Which I was concerned about given the low temperature. Have you found any fun new strains lately? I broke out the floor corker and bottle carb’d the C2C Saison today. It finished at 1.003 SG . Peppery and Pear plus a pineapple/leather funk while it was flat. I added enough sugar to get to 3.5 volumes of co2. I’m looking forward to tasting this carbonated in a few weeks. So far I’m pretty darn pleased with this blend. Here is the bottling setup. Since we have plenty of co2 I use 1psi to push the the beer into the co2 purged bottling bucket. While I am bottling I run a 1psi stream into the bucket to blanket the top while I’m filling bottles. Great to see your new post and I look forward to trying the C2C it sounds like my kind of strain. I love this site and your recipes. I have brewed your Brett Saison several times using WLP670 and have had great results but earlier this year I brewed the same recipe using Omega Bring on Da Funk and it’s is by far one of my most successful brews, super funky. I have a few bottles cellaring since April and I occasionally open one and find that the Brett just gets more pronounced. I also love using the golden naked oats for the body and mouthfeel I have incorporated them in to many of my recipes. That is weird. Mine was krausening out for 2 days. Did you o2 the wort? No, I shook the carboy vigorously for 5 min. I tasted it and there is definitely a nice funk developing. I didn’t get a gravity measurement but it’s very bright (flavored) and dry at this point. I was in Nashvegas last week for meetings and visited Yazoo for my first ETF taste. I really enjoyed the Gose and Brett’d Saison they had on tap. Keep up the good work! So what do you think the sources are? I’m not really in a position to come out and say the breweries I think they were sourced from. But just think about a world known north east farm brewery and a pacific northwest farm brewery. Wow, how do you get your beer so clear! My last Saison using 3711 and Belgian Saison turned out super hazy. I only used .5# of wheat. How long did it age? It’s still pretty young. It’s been sitting in the fermenter for about 3 weeks. I usually cold crash my beers but my chamber died on me and my kegorator is full, but I’m going to remedy that shortly! I’m starting to think it’s an equipment issue though. I built myself a single tier system recently, but I’ve noticed I don’t have quit as strong of a boil as I do on my single burners. It boils decently, but not super vigorous. Would that cause the major haze I’m seeing?